blog7t: Dartford parkrun 34 - This is fun! Dartford parkrun 34 - This is fun! 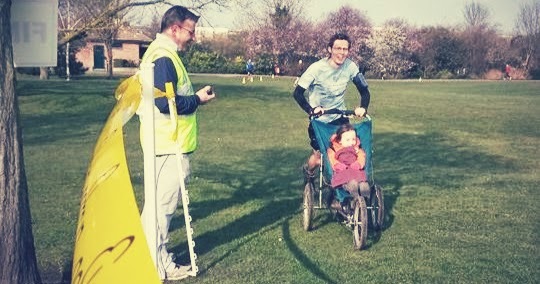 The night before parkrun, my daughter announced to me that she fancied a spot of buggy running, so at 6.30am the following day I was sat there on the bed trying to gently wake her so we could get over to the park in time to start setting up the course. About 15 minutes later she finally opened her eyes and confirmed that she still wanted to come with me. I got her dressed as she slipped in and out of her sleepy state. We left the house, grabbed the running buggy from the garage and hit the road to Central Park. As the first of the early bird volunteers to arrive, we got on with unpacking the kit and a few minutes later, Richey and Adam arrived. All together we set off around the course to put out the signage and cones. About 30 minutes later we were back at DpHQ where we eventually managed to get ourselves ready to run. When running with a buggy at parkrun I have often stuck to the parkrun buggy running guidelines which are to start at the back and to try to keep to the side of the main body of runners. However, if I start at the back and run at my normal buggy running pace, I end up within the main body of runners, which increases the risk of an incident. So..
..after weighing up the pros and cons, I have decided that the best starting position for me (at Dartford) is to line up on the main footpath to the side of the main field of runners (following half of the official advice) and to start at a strong pace so that I reach the first corner before the main body of runners. I can then filter in with the first 20 or so runners. And that's what I did at this event. We went around the course in the usual way. The muddy corner was still muddy but not as wet as in previous weeks. The subsequent incline is hard work on lap one, but always feels that little bit harder second time around. When running with a buggy, this is amplified further especially with the bumpy tree roots to negotiate. Matilda was very vocal on today's run and spent a great deal of time giggling and screaming 'THIS IS FUN! ', so I think it's clear that she enjoyed it. And apart from one point when a dog stopped right in front of us and we came to a halt, the run was incident free. When we finished, we quickly got changed, did a bit of writing down of non-scanning barcodes and as we had a very healthy supply of volunteers (lots of resting runners in advance of the next day's Dartford Half Marathon), we generally just chatted and soaked up the great atmosphere. Once the results had been processed, I was happy to see that we had run a new buggy running course best of 21.59. For the record, at the moment I reckon the course takes about 90-120 seconds longer to complete with the buggy compared to a standard time trial effort. That's around 8-10% slower than normal TT pace if you want to adjust it for different paced runners. It's the grass and that incline that does it - If it was flat and all tarmac it would be around 40 seconds slower which is about 3.3% difference.